The life of a soldier is filled with all kinds of dangers, taking fire, staying out of the enemy’s radar and extreme environment conditions. Among all these, an American soldier also has to worry about a continuous source of power for all the cool devices that he is relying on. 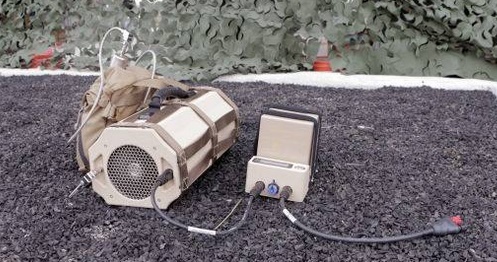 Currently, US soldiers use the standard Ultralife UBI-2590 battery for powering devices ranging from a radio to an antenna and even a smartphone. However, these bricks sized devices that weigh around three pounds a piece are not enough to satisfy the daily needs of a soldier. For this reason DARPA, the Defense Advance Research Project Agency, has built a lightweight, 350-watt propane generator which is enough to charge batteries on the field. This product, which is going to be as big as a duffel bag, has been built by DARPA’s Trans App program, a team of Ultra Electronics engineers. A propane powered generator may not seem a great idea, but for Recon Soldiers, who are stationed in the middle of nowhere and are exchanging life-saving information, being low on power might prove to be fatal. Traditional gasoline generators will make them easy to spot and dropping more batteries in the area will risk lives and carrying extra charged batteries adds a few pounds to their luggage. Propane being much lighter than lithium ion batteries, the soldiers will need to carry only enough batteries and charge them on the go. The power generated by one such propane generator is equivalent to 100 UBI-2590 batteries. Also the weight of those 100 batteries will be around 300 pounds whereas the propane generator with the tanks will weigh almost 31 pounds, almost 10 times. Even smaller 4 pounds tanks can be used for this purpose. Aiming to increase a soldiers efficacy in the field, DARPA wants to reduce the weight he needs to carry with the help of this generator. However, replacing the items in the backpack may take some time, they should also come up with harnessing the solar energy so that nobody would have to carry any power sources at all. Samsung Galaxy S6 Edge bends just like iPhone 6 Plus: Bendgate 2.0?